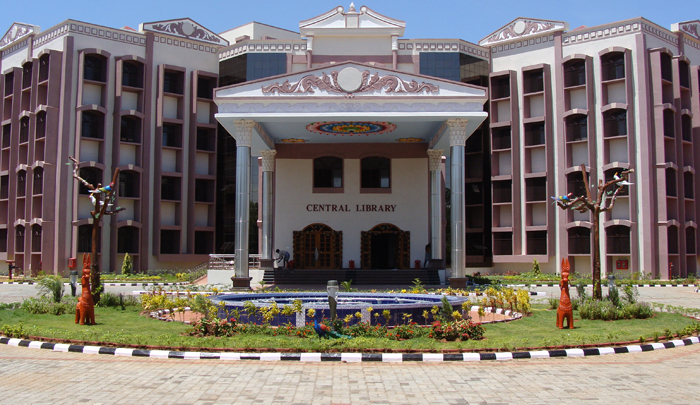 The Institute has a modern Central Library with more than two and half lakhs of documents consisting of Technical books, reports, standards, CD-ROMS, Audio Visual Educational Cassettes and back volumes of journals. The library subscribes to 164 periodicals (print) plus 7000+ e-Journals and 700+ e-books besides a holding of 17690 back volumes of journals. The library also contains 16,750 books in the Book Bank scheme. Digital Knowledge Centre has been established with 35 Ubuntu Computer systems with internet connection. Wi-Fi facility has been provided for laptop users. CCTV Web cameras have been fixed in the Central Library and the entire building is under camera surveillance. RFID Technology of Document Identification and Library Security System have been implemented for the library functions and services from 29th March 2013. Our Institute is holding membership with British Council Library, Chennai. We are also holding membership with DELNET, New Delhi and providing ILL (Inter Library Loan) services to the users. The Library functions such as Acquisition, Circulation control, Cataloguing and Serials control have been automated using an integrated software called “LibSYS”. RFID Library Security Systems and Technology has been implemented in the Library functions and services. Monday through Friday : 9.00 a.m. to 9.00 p.m.
Saturdays & Sundays : 9.00 a.m. to 5.00 p.m.
Dr. G. Thamaraiselvi,M.Sc., M.L.I.S., Ph.D.
Dr. P. Mounissamy, M.A., M.L.I.S., M.Phil, Ph.D.